The Wallabies had two enemies on the field – themselves and the referee. The actual opposition, the Springboks, came in a distant third. As one of my co-viewers mentioned at the time, it is a blight on the game that the Springboks can be described as the best team in the world when they don’t actually play any rugby. While the Wallabies once again crumbled under the pressure of their lack of self belief, the referee, the crowd, the occasion and the history, the Boks simply sat back, kicked the ball in the air, waited for mistakes and kicked the points. A telling moment was the 78th minute close up shot of centre Jacques Fourie, because it was at that point where one realised that he had been on the field for the whole game, but not once had been sighted with that ball in hand. Against any other team, the early exit of Stirling Mortlock would have had alarm bells ringing, but against the Boks, it meant nothing, because their centres were never going to take the Wallabies on. Morne Steyn, Francois Steyn and Ruan Pienaar, simply kicked, kicked and kicked again. And you can’t blame them. The IRB have encouraged this style of rugby through their incessant tampering with the laws, and they are now reaping the horrible harvest. Test rugby has regressed to a kickfest – a contest of which team has the best kicker – and a complete guessing game about how the referee might decide to interpret the various infringements. If this is rugby’s showpiece, then we are in dire straits. Sadly for the Wallaby tight five, they have worked hard to get to a point where their scrum is a dominant weapon, only to find that their backs are prepared to squander the ball that they have worked so hard to win. Matt Giteau must be removed from five-eighth sooner rather than later. He has long been touted as the equal of Dan Carter in the world flyhalf ranks, but tonight this was proven to be a sham. Luke Burgess didn’t help with his scatterbrained passing and some of Giteau’s poor composure must be put down to his halfback creating massive doubt in his mind as to where the ball would arrive, or if indeed it would arrive at all. Berrick Barnes on the other hand, stepped up to the plate while Giteau was serving his ten in the bin, and kicked with aplomb. With quick ball delivered by Genia after Burgess had been hooked, Barnes settled the Australians to the point where they looked like they might pull it off, but then Giteau rejoined the fray and spoiled it all. Coach Deans’ first order of business should be to swap these two, to utilize Barnes’ composure and accurate kicking game, and to free Giteau up to take on the line and loop in support of his outside backs. Ultimately though, it will mean little if the Wallabies aren’t prepared to take on their opposition and seize some chances to attack. The Wallabies took a step back in time to the old days where they were so locked into a game plan, that they couldn’t get out of it, even when the occasion demanded. So much so, that we saw Drew Mitchell, with 6 minutes to go, and a 10 point margin, kicking the ball back to the Boks from the brokenest of broken play. The idea of running it back supported by Turner, O’Connor et al didn’t appear to have occurred to him. I haven’t yet mentioned the referee. Mr Rolland was horrendous and the only redeeming feature was that the Wallabies were bad enough to lose it on their own, so there is no need to blame him. He penalized the Wallabies in their first scrum for a crooked feed, only to let both sides continue to feed like that for the rest of the match. He penalized both sides for killing the ball while they were hard on attack. He missed several forward passes, and penalized some that weren’t. His ruck interpretation was inexplicable and he also allowed himself to be bullied by John Smit. You can’t blame Smit by the way – any good captain should try it on, and it’s the ref’s fault if he succeeds, but it was rubbish of the first degree from Rolland, and any momentum that either side may have developed was completely destroyed by his histrionics. While all this was going on, the Boks did what they do best and piled up points. They didn’t play rugby, but they didn’t need to. They played the game plan which basically removes the chance of them making errors and gives them every chance to accumulate points. In the Test arena, you have to admire the application of a team who can be so single minded about their approach, even if you don’t actually enjoy it. Where to from here for the Wallabies? It has to be results. There can be no more talk of “development”, of “learning”, of “going in the right direction”. They have now lost to an All Blacks side which is one of the worst since Taine Randell’s All Blacks, and then to a Springbok side which is simply a one-trick pony, albeit a thoroughbred. 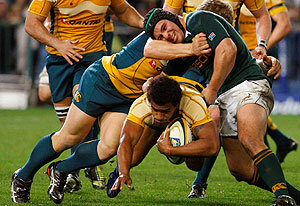 That said, both of these teams have something the Wallabies don’t, and that is steadfastness and application. The ability to hang around, remaining there or thereabouts on the scoreboard, and give themselves a chance to win at the death. With Berrick Barnes’ field goal, it seemed early that the Wallabies may have heeded this lesson. But it wasn’t to be. The Tri-Nations is won and lost on the road. The Wallabies have squandered their chances thus far, and now instead of having a chance to win, will be fighting simply to remain in the contest. It would be nice to be optimistic, but there’s little reason for optimism. So Wallabies supporters – brace yourselves. This Tri-Nations could actually get worse. Andrew Logan has played rugby for over 25 years. A contributor to The Roar since its inception, he also writes for Inside Rugby magazine, and Super Rugby and international match day programs. A regular panellist on ABC Grandstand discussing rugby and other sports, Andrew has appeared on ABC's The Drum and also Sky Sportsline. He has convened and managed several touring sides including the Australian Rugby Sevens team on the IRB circuit, and the Australian Barbarians XV.